The Vampire Diaries Season 1-8 :The Vampire Diaries is a very popular, award-winning and long-running American horror, mystery, romance and supernatural drama television series that is currently airing on The CW channel in the United States.The Vampire Diaries Season 1-8 DVD Box Set The hit TV series was created by Julie Plec and Kevin Williamson based on the eponymous book series written by L. J. Smith. 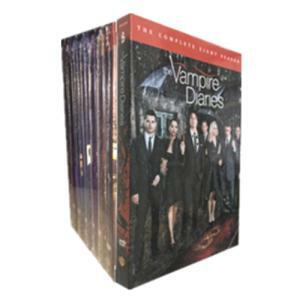 The show is co-produced for The CW by Alloy Entertainment, Outerbanks Entertainment, Warner Bros. Television and CBS Television Studios, and executive produced by Bob Levy, Leslie Morgenstein, Julie Plec and Kevin Williamson. Season 1 of the supernatural drama series debuted on The CW channel on September 10, 2009.